The history and success of the program. State, local, tribal, international & Federal Junior duck stamp programs. How to collect and display duck stamps. Profiles of famous collectors and the rarest duck stamps (major errors and varieties). The duck stamp art contest - "the richest art competition in the world" - and insights into judging and winning. 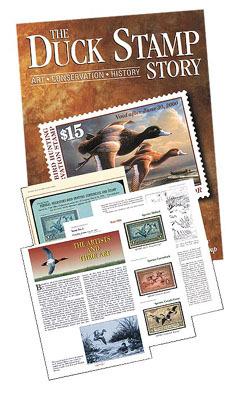 Appendices with statistics, fun facts, and images for all federal duck stamps, and the values for all stamps and duck stamp prints. The most comprehensive and exciting book ever written on the Federal Duck Stamp Program. Hunters, stamp collectors, conservationists, art enthusiasts, and bird-watchers will enjoy this book for years to come! "The Duck Stamp Story is the wonderfully told tale of the public�s love for wildlife conservation ... a marvelous job of bringing the world of duck stamps to life." "This volume should meet the expectations of even the most critical scholar of conservation and philately." "It will stand the test of time as the definitive history of the Federal Duck Stamp Program. A must for stamp collectors, artists, and wildlife enthusiasts." $5 shipping and handling will be added. $2 for each additional book. Personalized autographs from co-author Bob Dumaine available on request. A portion of the proceeds will be donated to the U.S. Fish & Wildlife Service to acquire critical habitat and expand our National Wildlife Refuge System.